The “Fresh Waters" are extraordinarily refreshing and pleasant waters that complement with its delicious flavors the typical Mexican gastronomy. Moreover they help to beat the heat and to rest the palate after a typical spicy Mexican dish. The Mexican families accustom to prepare these waters with different fruits like lime, mango, orange, papaya, chia, lychee, etc. – however among these ingredients the rice also exists , from which the horchata water is obtained. What you are going to taste in this water is a combination of different flavors because the horchata water is fresh, sweet, cold and the cinnamon’s spiced touch can never be missed. In Mexico the horchata water is served a lot in taquerias . Therefore if you make some tacos you already know which drink to prepare. This water is also prepared throughout Latin America, where each country gives its special touch. Making the horchata water is extremely easy, a very good recipe for beginners. We recommend not to use precooked rice to prepare this water. Just use a raw white rice. 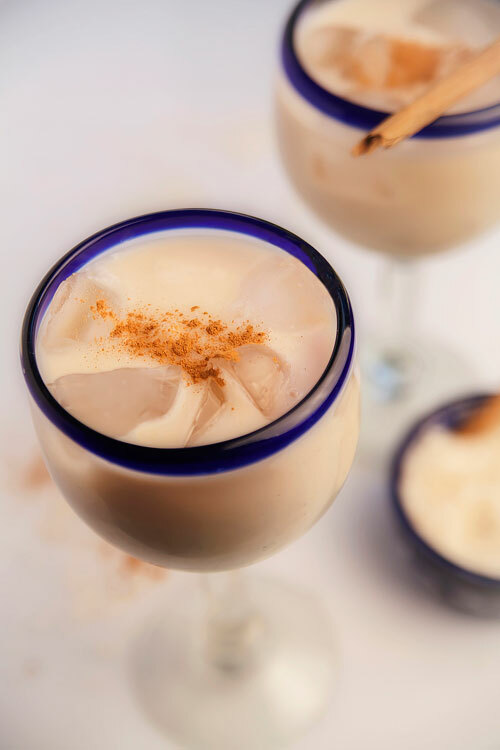 In this recipe vanilla extract is used, which gives to the horchata water an exquisite touch. If you don’t have it try to get it, it really makes a big difference. Your horchata water will be ready in 5 minutes . However also has to be taken into account that the rice is left soaking for 2 hours. This recipe serves a little more than 2 qts. Rinse 1 cup of white rice in a strainer. Transfer from the strainer to a bowl the white rice that was rinsed. Also add in the bowl 1 cinnamon branch. Cover the bowl ingredients with water and leave them soaking for about 2 hours, until they are soft. Verify that the rice and the cinnamon branch that were left soaking are soft, if not leave them soaking for a longer time. Transfer from the bowl to a blender the rice and the cinnamon branch that were soaked, with its water too. 1 can of Evaporated Milk. With the evaporated milk and the condensed milk, the horchata water acquires a fantastic thick consistency. Ice Cubes to taste (optional). Stir the horchata water with a kitchen spoon. * If your mouth is burning while eating Mexican food, this water is very good to relieve the hotness. Variation: In some places the horchata water is prepared with cantaloupe seeds... but that’s another recipe. Did you like the Horchata Water? Use this rice to prepare the horchata water. As it is organic it gives a great flavor to the water. This is the vanilla extract that you have to put to your horchata water. It is made of pure vanilla, the flavor and fragrance are really amazing and the funny thing is that the flask contains a vanilla bean. Such a Mexican water as the horchata water has to be prepared in a Mexican glass pitcher, to give that festivity touch.